Perfect for any special occasion, this traditional basket is filled with fresh fruits and gourmet selections. An experienced local florist will fill a basket with hand-selected fruits that may include apples, oranges, pears, grapes, or other fruits. Gourmet foods that may be included are cheeses, crackers, chocolate, or candies. Exact basket is a one-of-a-kind creation. Photo shown online is a representation only. Specific basket, ribbon, fruit pieces and gourmet items included in final product will change based on local availability or designer's choice. Select Gourmet Fruit Basket is a hand delivered gift. These gifts are delivered by one of our local design centers located throughout the United States and Canada. Same day delivery is available for most gifts when ordered before the cutoff time. 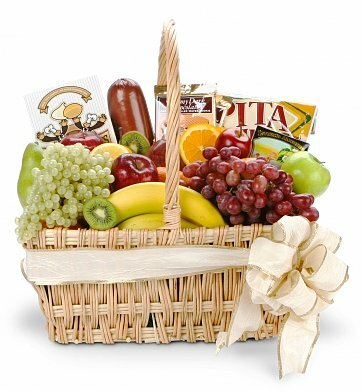 The cutoff time for Select Gourmet Fruit Basket is 1 PM in the recipient's time zone. I ordered a basket for same-day (Saturday) delivery to a remote area. When I placed the order I was doubtful that they would be able to deliver but the order went through online. A short while later, someone called me to inform me that it was too late to deliver to that area (I was not surprised at that part). What did surprise me was her offer to call my gift recipient & inform them that I intended for the gift to be delivered on that day & offer apologies. She graciously did so and the next business day the most amazing basket was delivered! My gift recipient was thrilled. I will definitely use them again because of their customer service and fine product! Thank you! I received a call thanking me for such a great gift, they were so pleased with the fruit. Thank you so very much! The basket was perfect and delivered quickly. I would recommend you to anyone who is wanting a beautiful and unique gift sent. We sent this as a sympathy gift and our friends were extremely satisfied. Thank you. This was a last minute (same day) gift, which my father sent me pictures of, and I was pleasantly surprised that whoever picked out the stuff used some high quality, local products. Purchased this as a gift for my brother and sister-in-law. They both said it was beautiful and greatly appreciated. GREAT BASKET TO GIVE A FAMILY WHEN THEY ARE GRIEVING AND I HAD ORDERED AT LAST MINUTE, WHICH GOT THERE SAMEDAY DELIVERED ON TIME. THANKS SO MUCH, THIS FAMILY WAS VERY HAPPY.... GREAT WEBSITE AND BASKET, I RECOMMEND THIS BASKET TO ANYONE. I sent this fruit basket to my dad after hip surgery. His comment, "This is the most beautiful fruit basket I've ever seen." entire basket which makes me happy. The family that received this basket really appreciated it and said it was lovely. It had a nice variety of items and was enjoyed by all. My employee lost her farther and had alot of company. some comfort during her bereavement. The recipients of the gifts I sent from you bought all of the basketsand flowers arrive in excellent condition and looked very "high-end". From their decriptons, I know I chose the right place to order my giifys from. Thank you for your excellent service! I sent this for my sister's birthday and she told me that her and her husband made a picnic out of it. For DAYS! I highly recommend this site and this gift! I have ordered items from this sitefor quite a few years now and I have NEVER been disappointed. Baskets offered by them are the best alternatives to flowers, etc. Recipients love the beauty of the prepared gift and enjoy the items at their leisure. They do not have to watch flowers die. All recipients call to thank me for the surprise, beauty of the presentation, mix of items given, and most of all, the taste! Thank you. My only complaint is having to decide from the many beautiful and varied offerings. We sent this to our Brother who just lost his wife. He said it was wonderfully good and got eaten up right away. He thanked us very much. We just thought it might be better than sending flowers. We knew he had a housefull of relatives and thought food would be more useful than flowers. More importantly I ordered online in minutes!! Shipped ontime and I was told the basket looked great when it arrived!! Excellent company to deal will! good product! Second purchase and very satisfied.